I'm laughing as I type this because the blog below is about me being a fatty Mcfat fat and here I am posting a cookie recipe and eating one while I work. Awesome. If you follow me on Instagram then you saw this picture, and let me tell you that they taste WAY better than they look! I was at Trader Joes this morning and came across a bag of rolled oats. 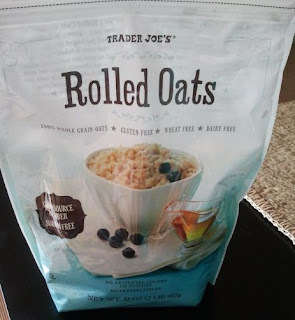 I'm always looking for new breakfast ideas & loved this because they are gluten free, a great source of fiber and sodium free! As I was checking out the gal said, "Ohhh, are you making the cookies?" COOKIES?? I said. She raved about the recipe on the back & you know me & COOKIES! I drove home and made a batch before I even made lunch. Shame on that lady for telling me about the recipe. I'm addicted. Preheat oven to 350 degrees. In a large bowl, combine sugar, brown sugar and butter and beat until creamy. Add eggs, vanilla and baking soda and mix well. Add peanut butter and mix. Stir in oats and chocolate chips. Place teaspoon full of dough on parchment paper. Bake 8-10 minutes. Just until they are lightly brown around the edges. Side note: I threw all the ingredients in at once in my Kitchen Aid and they were just as awesome. Yay for not feeling as guilty in indulging in chocolate chip cookies!